With the constant support of vendors, we are engaged in exporting and supplying a wide assortment of Party Wear Shoes which has easy to clean and have slip resistance sole, the offered shoes are manufactured at vendor’s production unit, under the direction of vendor’s skilled professionals. 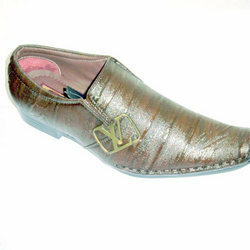 Our shoes are checked by vendor’s quality controllers on various parameters. Looking for Party Wear Shoes ?